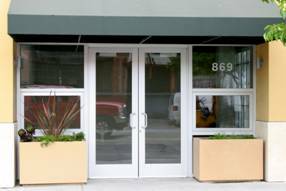 R&S offers multiple solutions for your Glass Storefront needs. New construction, retrofits and repairs are our specialty. 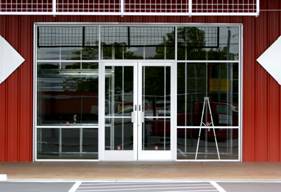 Email us today for an onsite evaluation of your glass aluminum storefront doors. R & S is not your ordinary door company and Special-Lite, Inc. is not your ordinary door manufacturer. These doors offer exceptional value and durability even in the harshest and most demanding installations and they are made to endure. Special-Lite pioneered Fiberglass Reinforced Polyester (FRP) Flush Doors in 1981 to meet the extreme demands of the school market. Our FRP doors offer trouble-free performance and long-lasting beauty in the most challenging interior and exterior entrance applications. Remarkably durable, they can withstand heavy traffic, abuse, or adverse environmental conditions – and continue to look like new for many years. Unlike metal or wood doors, they will never rust, corrode, crack, split, peel, or rot. With FRP face sheets the color goes through so scratches won’t be obvious. When you consider total lifecycle cost, Special-Lite FRP Flush Doors are the first choice for lasting value. The proof of product excellence is found in its guarantee. Special-Lite offers an uncomplicated 10-year, 100% parts and labor warranty. Refer to the warranty statement for details. SL-12 Narrow Stile – 2″ stiles, a 2-1/4″ top and a 4″ bottom rail. SL-14 Medium Stile – 3-5/8″ stiles, a 4″ top and 6-1/2″ bottom rail. SL-15 Wide Stile – 4-1/2″ stiles, a 4″ top and a 6-1/2″ bottom rail. Ballistic Resistant Doors: Factory constructed to be virtually impenetrable to ballistic attack.